Home Guides How precipitation is formed? You may think that precipitation sounds like a bit of dull subject , but we’re not just talking about rain and drizzle it also include extreme weather – such as hail storm and blizzards. In this shot guide we’ll be looking at those examples of extreme weather and finding out how rain hale and snow are formed. 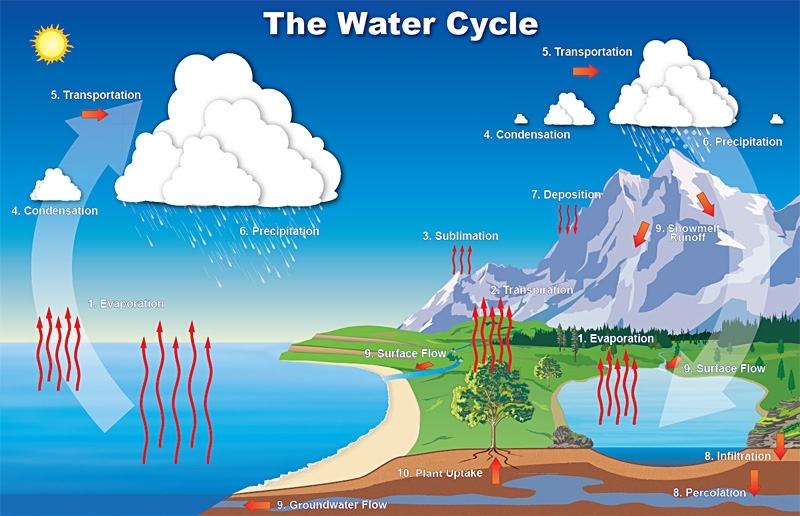 All precipitation develops in clouds, and clouds are formed when water vapor in the atmosphere cools and condenses. As the water vapor condenses into it forms droplets and if the clouds develops within or moved into the part of the atmosphere that is below freezing then the droplets form ice crystals. The cooling process which first forms clouds can happen in many different ways. Air may be forced to rise along the warm front and as it cools, deep layers of clouds can develop – sometimes reaching many thousands of meters all the way down to the ground level. Air may also be forced to rise as a cold front approaches. In this instance a wedge of cold dense air pushes under the warm moist air ahead of it – lifting it. 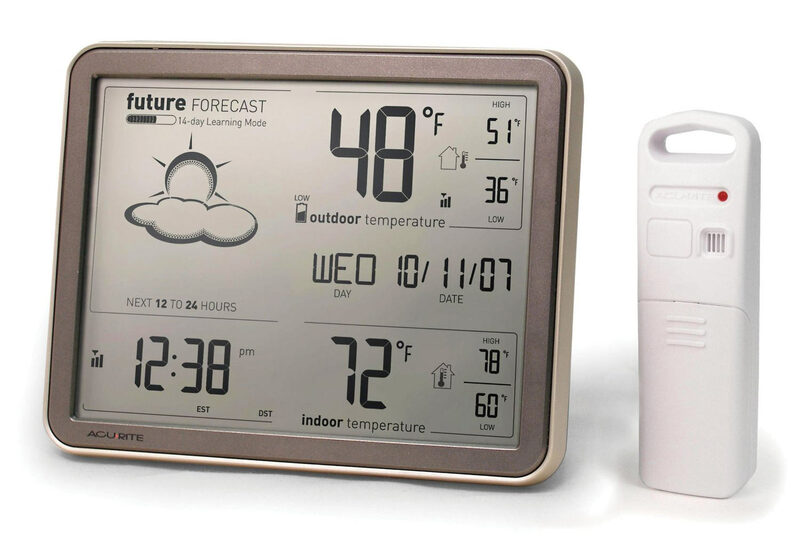 Weather fronts tend to bring generally cloudy skies with relatively long spells of rain and drizzle or snow in the colder times of the year. And finally air may be forced to rise, simply because it’s heated by the earth’s surface and it convects. This is what we often see on a summer’s day with cumulus clouds building up and sometimes developing into cumulonimbus clouds. Then we can get very heavy rain and even hale. Let’s look first at rain in drizzle. The only real difference between rain and drizzle is the size of the droplets. Drizzle is composed of very small droplets – half a millimeter or less in diameter. The tiny droplets that fall from the cloud itself, merge together until the droplet size brcomes large enough to drop from the cloud under its own weight. Even though drizzle is made of small droplets It can still produce some very poor weather. Heavy drizzle can seriously reduced visibility, because the droplets are small when close together. In tropical climates where deep clouds developed in warm air, this coalescing of droplets can produce quite heavy rain . When clouds build in air that is below freezing we often get the mixtures of ice crystals and super cooled water droplets – that is water which is just below freezing, but hasn’t yet turned to ice. It is this mix of ice crystals and super cooled droplets that is really the key of understanding how most precipitation forms. The ice crystals are able to grow rapidly, when there is super cooled water nearby because as soon as the super cooled water makes contact with the ice crystals immediate freezers. Then as the crystals drift through the clouds, they connect with other ice crystals in a process called aggregation, and large snowflakes are formed. This process of aggregation can take place in any fairly deep cloud, whether is formed in layers along the waterfront or by the convective bubbling-up process. If the air between the base of the cloud and the ground is no warmer than 2 degrees Celsius, then the snowflakes reach the ground intact. In warmer condition when the air beneath the cloud Is above 2 degrees Celsius, then the snowflakes will melt and arrive on the ground as rain drops. This is the way in which almost all significant rain is produced in our latitudes. It starts as a snow but melts before it reaches the ground. The most energetic cloud types, and the walls which can produce really heavy rain, are driven by strong conviction. As the air cools, the water vapor condenses into water droplets forming clouds. As the clouds grows up through the atmosphere, It will soon pass the freezing level and water droplets within the cloud, will freeze and from ice crystals. 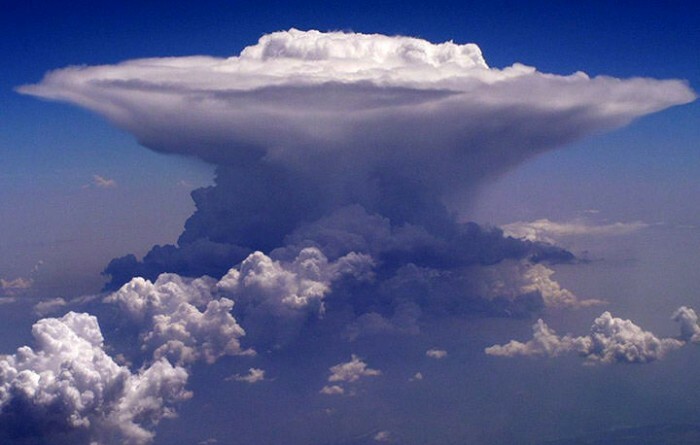 The process is called glaciations and anvil shape is typical of cumulonimbus clouds or thunderhead clouds. The fuzzy edges of an anvil cloud show that there are ice crystals present and the cloud is grown well beyond the freezing level. These ice crystals growing are the water droplets nearby freeze onto the surface creating a coating of ice and small hailstones are formed. Inside the cloud there will be rising currents of warm air and some quite severe downdrafts of cold air. Small hailstones may fall through the clouds, helping to create the downdraft. They can also be carried back up through the cloud by the rising current of warm air. This can happen many times with the hailstone melting and freezing and developing fresh coat of ice during its journey through the sub zero part of the cloud. If you’re brave enough to venture into hailstorm you can actually cut a hailstone in half and see how the layers of Ice and built up like an onion as a hailstone travel up and down within the cloud. In really severe storms that process is repeated so often and the currents of air are so strong that hailstones as big as golf balls can be supported. In really severe storms hailstones as biggest as tennis balls have been recorded. The largest hailstone ever recorded in recent times came from Bangladesh in 1986 and measured up in 15 centimeters across. It weighs over a kilo as a same as a bag of sugar. If you want to learn more about precipitation and how to measure it please visit our article. How The Sun Affects Weather – The Basics?